It’s an exciting moment when the job offer comes through, particularly if it’s the job you most wanted, but what if the terms aren’t quite what you’d expected or hoped for? When is it ok to negotiate? You’ll want to feel happy with every aspect of your new job, but you’re bound to be worried that your prospective employers won’t be too pleased if you try to bargain. You’ll need to weight things up carefully. The key to successful negotiations is an understanding of who is most keen to compromise. So, who holds the balance of power? How important is it to you to get something changed and how important is it to the employer to get you on the team? What if the offer is for a big graduate scheme? If you’ve applied to a big graduate scheme with lots of vacancies to fill and large numbers of applications then your scope for negotiation is going be limited. The salary and terms will be fixed but that doesn’t mean that you can’t negotiate at all. The company has probably already spent quite a bit of money on the assessment process and has chosen you. At this point their preference will be for you to accept the offer, but if you don’t it won’t be too difficult for them to find someone else. They might be prepared to compromise on small issues. You’re going to be discussing any possible changes with the Human Resources department. Your future line manager will probably never know about the conversations you’ve had so there is no embarrassment about asking for some changes. Be realistic- what might get changed? What if your offer is from an SME? The position on negotiation is potentially very different if your job offer has come from an SME (a small or medium sized enterprise). It’s quite possible that no salary or terms were advertised, and it may be that the job has been created especially for you following an internship. It you want to negotiate, you’re probably not going to be talking to the Human Resources Department, but perhaps directly with your future line manager. This is going to feel more personal and might need to be handled with considerable tact. A good employer shouldn’t object to negotiations provided that you remain utterly professional. If you sense that a polite and reasonable request from you has gone down really badly, you might want to rethink whether this relationship is going to work out. What if the offer is for a fixed term position? 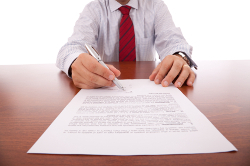 Some SMEs will offer you a fixed term contract for a specified period of time. This might not be what you want but could be worth accepting and it may offer you a “foot on the ladder” to a permanent job. You’re probably going to feel anxious as the end of the contract nears and it could be worth asking the employer to give you an end of contract bonus, payable when the contract expires. You can sell this on the basis that it will encourage you not to look for other jobs until after the end of the fixed term, it gives the employer the comfort of knowing that you will stick around and you know that if you do need to find another job you will have a cushion of some money to support you while you look. As you ponder any job offer keep thinking about the basic considerations. Who has the strongest position? You’ll need to be realistic. A small company may not be able to afford the sort of salary you were hoping for but equally you’ll need to be confident that you’re going to be earning enough to pay the bills. You might also want to think about the training you’re going to get. There’s unlikely to be a set process (as with the big graduate schemes). 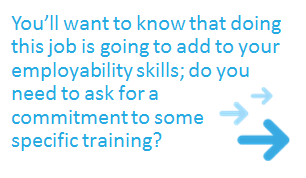 You’ll want to know that doing this job is going to add to your employability skills; do you need to ask for a commitment to some specific training? What about holidays, pension and sick pay? Do make sure that you are clear of the whole scope of the package before you make a final decision. Remember that your careers support doesn’t end when you get the job offer! Your careers consultant can talk you through the implications of the job offer you’ve received and help you to decide whether and to what extent you want to negotiate. You might also want to check out our previous post on responding to job offers. Tags: Applications, Appointments, Employers, Graduate Recruiters, Job offer, Job search, SME. Bookmark the permalink. Previous post ← Strengths based interviews – more top tips!